Without Kerberos Pre-Authentication a malicious attacker can directly send a dummy request for authentication. The KDC will return an encrypted TGT and the attacker can brute force it offline. Upon checking the KDC logs, nothing will be seen except a single request for a TGT. I don’t believe that pre-authentication adds any level of security as you can read in this nice article (section 3.1). So, if you decide to do it, you may act only on Your own behalf and on Your sole responsibility 😀 . Categories: BigData | Tags: Active Directory, AD, ambari, kerberos | Permalink. How to disable Kerberos in Ambari? When you fall in the case where your KDC is down and you can’t reach it anymore, it will impossible for you to disable the Kerberos Security through Ambari GUI. Actually, when you request Ambari to disable the Kerberos security via its GUI, it will try to start your Zookeeper to update the different nodes’ configuration. However, if your KDC (or Windows Active Directory) is unreacheable, you can’t go further. You may try to manually edit files or clean the Ambari database. If you have no luck with this, try to use the REST API, and here is how. This should invoke the Ambari process “Disable Security”. 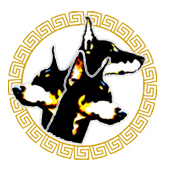 You can find many other details about Kerberos REST management in the groovy KerberosService. Categories: BigData | Tags: ambari, disable, hortonworks, kerberos | Permalink. 1 – Run this curl command to get installed services on this host (admin:admin is the username:password you were using to access your Ambari GUI, cluster_name is the name of your cluster). 4 – Check the rest of the services depending on this host. We are always still waiting for the Ambari multi-cluster support and the famous multi-everything architecture from HortonWorks team. Categories: BigData, Web | Tags: ambari, api, HDP | Permalink. How to concat two fields in schemaless mode with Solr in Cloud mode? 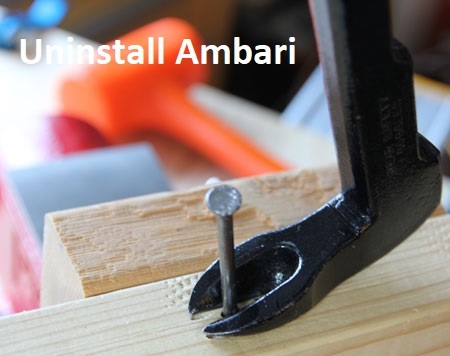 If you want to remove an Ambari-through install of HDP components, you will have to it manually. Actually, Ambari gives you a way to uninstall services and remove hosts. But, this feature assumes that you have completed the components install process successfully. What if the process fails somewhere when installing? In my case, I collected all the commands from many posts and grouped them into one single script. You can find the script in my github. By the way, this is a very well written manual on how to setup HDP 2.5. Categories: BigData | Tags: ambari, HDP, uninstall | Permalink. 1 – Why would someone use Solr to search on a wide-column database (HBase)? The power of HBase search (scans) is not filters. All is about the rowkey design. If you want to take full advantage of HBase, you must know all your search queries at the moment of deigning your database. This way, you will put all the “search” intelligence in your rowkeys. But what if you don’t know all your search criteria at the beginning? What if you need to add extra search criterias? Would you create a new “view” of data with another rowkey strategy? What would you do if your client needs to search by “proximity” or a did you mean style? There is no answer for this question than “it depends”. 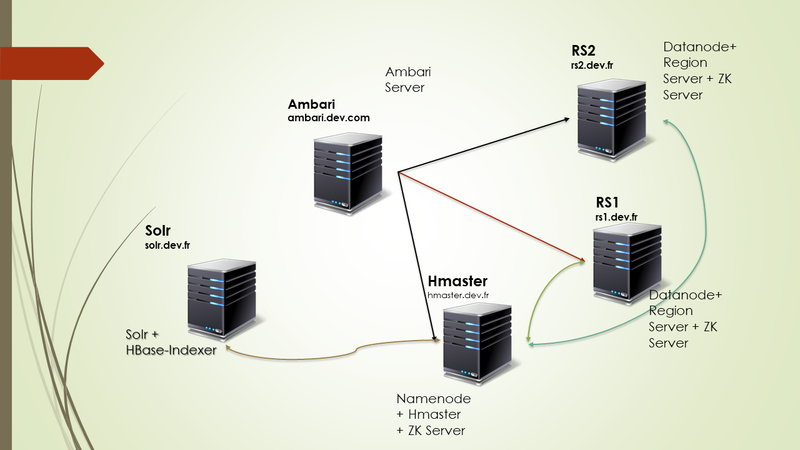 2 – Why we did not use Ambari for Solr deployment? It is not integrated offcially, it does not bring any added-value, it adds some more complexity in ambari-agents scripts (must be altered manually for this use case). Categories: BigData, Solr | Tags: HBASE, hbase-indexer, Solr, zookeeper | Permalink. The scope of this post does not cover Hadoop/Hbase setup. I asume that you have a running Hbase environment with a Master (HMaster) and two region servers (rs1 and rs2). I’ll be using the HDP2.5 release from HortonWorks setup on CentOS 7.2. Actually, I don’t want Ambari to manage my Solr instance because, we have some specific configurations to add and we won’t alter default ambari-agent’s behaviour. Categories: BigData, Solr | Tags: HBASE, hbase-indexer, HDP, lucidworks, Solr | Permalink.